Sometimes I feel like a dog in China, and this was particularly so during our motorcycle expedition across the “middle kingdom”. I got fed once a day; complete strangers would come up to me and stroke the hairs on my arms; I had to pee against trees and lampposts; certain hotels and public places wouldn’t let me in; and a lot of the time I hadn’t a clue what was going on or what people were talking about. But it wasn’t all bad… could have been worse. I could be back in “Blighty” and forced to wear “health and safety” hi-viz clothing, live in constant rain, survive on a diet of lard, and have to watch mind-numbing Sky News and endless episodes of Jeremy Kyle tormenting the underclass on television. So, I guess its not so bad being a pet “laowai” in “zhongguo”..
For the large part I like China, its people, its food, its customs and traditions, and I especially like the entrepreneurial “can do” attitude and pragmatism that pervades life in general. There are of course a lot of things that I don’t care for too much. From the seat of a motorcycle, exposed to all the elements, your senses are heightened and you are completely immersed and aware of all your surroundings. Riding each and everyday through the People’s Republic of China it was easy to see where further economic and social development could be made, and where attitudes to things like environmental conservation and human rights should be made. The towns and cities, which number into the tens of thousands are invariably ugly, noisy, dusty, boring concrete jungles…devoid of any imagination, architecture or charm. The classic 21st century Chinese structure is a bodged concrete terraced row of garages with three or four floors above, finished with bad grouting, windows with jailhouse bars, god awful bogs and adorned on the outside in public lavatory tiles. The modern day Chinese builders’ mantra must be “Fook it .. that’ll do”. At this stage of our trip I was going through a bit of a low point. I was getting really tired and fed up with the pollution, tired of the ugliness, tired of the trash and litter that was strewn everywhere, tired of the smashed up roads, tired of the selfish and inconsiderate driving, tired of the slovenly and revolting behaviour of some of the people, tired of the dust in my eyes, tired of the smell of sewage, tired of being constantly on edge and alert to the dangerous riding conditions, tired of riding through one dusty grey town after another, and especially tired of oncoming cars, buses and trucks overtaking into our lane and bullying us off the road. Did I mention I was getting a bit tired..? So as the sprawling mess and chaos of 21st century third tier urban China slowly turned into the green and unique relief of the karst limestone mountains that surround Yangshuo and Guilin my mood improved.. a bit. This part of Guangxi province is truly spectacular and there are few places in the world as beautiful or quite so unusual and fascinating to look at. The farms and fields and network of canals and rivers are particularly special and for the first time in a few days I was beginning to enjoy myself. Fanny had earlier decided we should go to Xingping which is how the touristy town of Yangshuo used to be a decade or so ago before the corrupt local authorities and developers started ruining it. 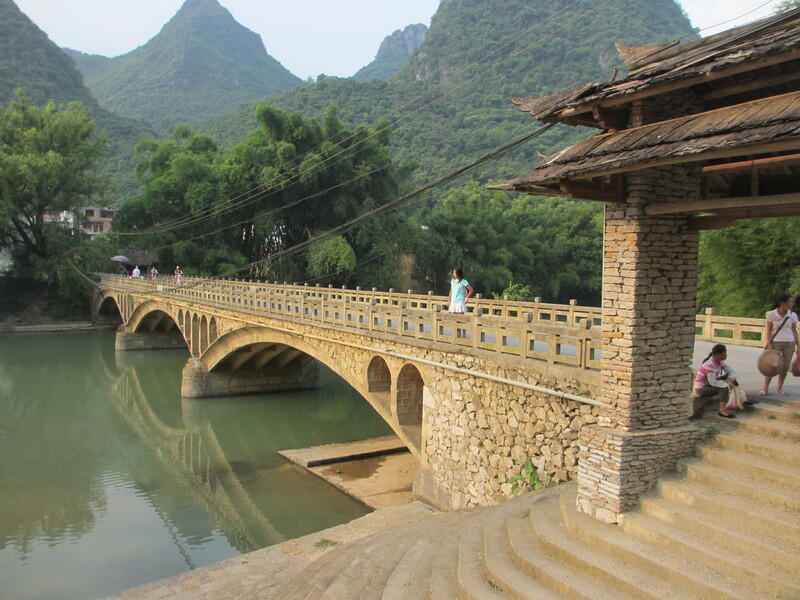 For now anyway, Xingping is relatively undeveloped and remains quite peaceful and charming. The stunningly beautiful view from the banks of the Li Jiang River in Xingping is actually depicted on the back of the 20 Yuan bank note. It must be special as there are only six different bank notes in China, each with a picture of one of its most special landmarks on the reverse. I climbed to the top of one of the karst limestone hills (220 meters) in Xing Ping to take pictures of the surrounding hills along Li Jiang river towards Yang Shuo. Quite spectacular and ever so slightly precarious at the top. I was also enjoying riding along the twisty roads and between the karst mountains that rise out of the ground like huge mushrooms, but I had to admit I was missing the power, handling and excitement of my KTM 990 Adventure motorcycle. My KTM would have been ideal for the route we had taken so far and its physical presence and the roar of the Akropovik exhausts would have cleared a decent path through the hoards of the great unwashed and presented a formidable opponent to the bullying black Audi A6s that lord it over everyone on Chinese roads. That said, our CF Moto 650 TRs were not bad at all and were handling pretty well. It was a very pleasant surprise to me as Chinese bikes up to now were nearly all small, cheap, cheerful and had a reputation for not being particularly reliable or well made. Our CF Motos were very different. The 650 cc parallel twin cylinder engine is excellent and very smooth across the whole power band. I could hardly describe them as powerful, but the bikes were more than fast enough to my mind, reaching a respectable 180kph without any shake, rattle or roll. They are surprisingly quiet too, both from wind and engine noise and we purred along quite happily. The KYB front and rear shocks are good quality, but neither the front nor rear are adjustable and so the setting is not always optimal to all the road surfaces we rode over. However, on the majority of normal tarmac roads they did the job well enough, although a bit bouncy when hitting the wavy corrugations and depressions caused by the seriously overloaded trucks. Cornering through the twisty mountain passes, always a litmus test for a good bike, was surprisingly good and whilst not as flickable as a true sports bike like a Yamaha R1 or Honda Fireblade, not bad at all. In fact, I was enjoying myself and Fanny’s confidence on the corners had definitely improved as I saw her banking over nicely and moving swiftly through the many corners and mountain twists. On the off road sections (i.e. no road surface at all) the bike is quite nicely balanced and we were able to navigate around the debris, cracks and potholes easily enough. Occasionally we would plummet off the edge of the tarmac or concrete into a pothole and crash out again, but with 17 inch wheels front and back that’s to be expected. Its a road bike and naturally likes being on roads but I would not be too concerned taking it onto gravel and mud, as we did quite a few times. The Chinese made CST 616 tubeless radial tyres that come standard with the bikes seemed to do the job, and when we eventually pulled into Shanghai, 13,600 kilometers and two months later, the tyres looked as good as new. My only complaints I suppose concern the quality of the mirrors that distort the rear view far too much, and the seat which started to get rather uncomfortable after 200-250 kilometers of riding. With bum weights of 88Kg for myself and 68Kg for Fanny the foam deformed down onto the plastic frame a little too much and the resulting angle forced both of us to lean too far forward causing my crown jewels to press against the petrol tank and our bent knees to squash against the petrol tank rests on the sides of the fairing. That said, no different to many other similar styled bikes I had ridden and luckily the cushioning of the pads in our Rev’It enduro trousers softened the pressure on our knees. I suppose there is not much I can do about having a huge pair of 鸵鸟蛋 on any bike I ride! Later I bought a sheep skin to put over the seat and this made a huge difference. I found, compared with riding the previous 40,000 kilometers on the KTMs in Africa and Europe, that my eyes were tired and sore at the end of each day. I think this was due largely to the terrible pollution and dust particles in the air in most parts of China, and not helped by the low streamlined windscreen design on the 650 TR that seems to accurately direct the wind straight into my visor. It would be better if the windshield was adjustable or had a pelican scoop at the top to deflect the wind up over my helmet. Later versions of the CF Moto 650 TR would address this with a much better designed touring windshield as standard, but for now this was a minor irritation that we had to put up with. There are few bikes that allow such extended periods of riding standing up on the foot pegs with such confidence, comfort and control as a KTM 990 Adventure. With The CF Moto 650 TR, the riding position is typically that of a sports tourer, although when I toured Europe some years back on a Suzuki GSXR 1300 Hayabusa the ride was perhaps a little more comfortable because the motorcycle is bigger and despite being a bit of an ugly beast perfectly streamlined for high speed touring and long distances. 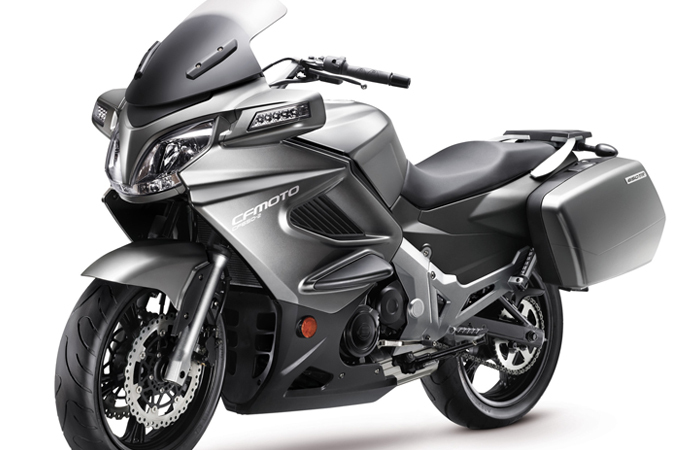 Overall, however, I have been impressed with the CF Moto. Not bad at all and definitely superb value for money. 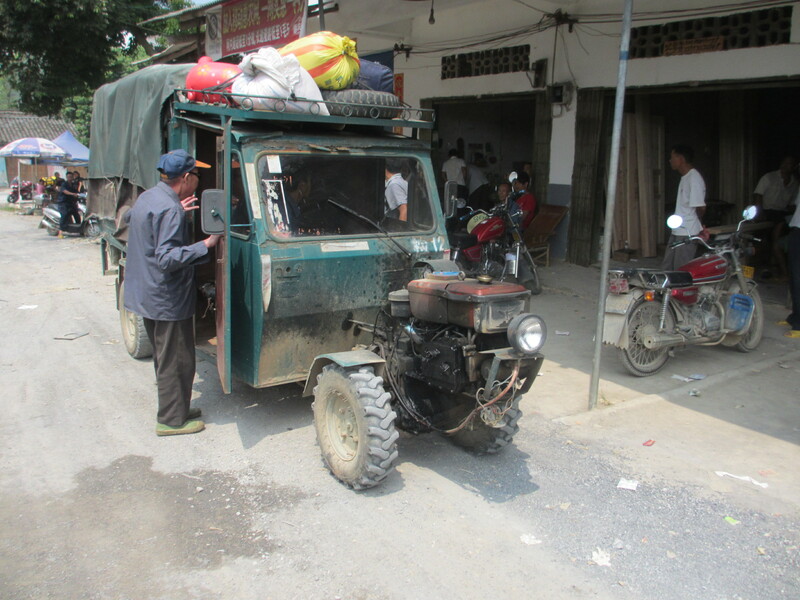 This xiangbalao vehicle veered into our path in Guangxi and knocked Fanny off her bike. The driver, having the IQ of a haddock and the social charms of a Chinese peasant couldn’t care less. We stayed in Xingping for a few days, hired bicycles and toured through the countryside, orchards and vegetable fields along the river banks and I went swimming in the Li Jiang River. I also did some climbing which tested my acrophobia somewhat as some of the cliff faces had to be scaled using precariously attached metal ladders that swayed and wobbled under the strain of my European girth. But it was worth it as the view from the top, especially at dawn and dusk was truly spectacular. Both Xingping and the climb are highly recommended places to visit and quite easy to get to from Hong Kong or Shanghai. 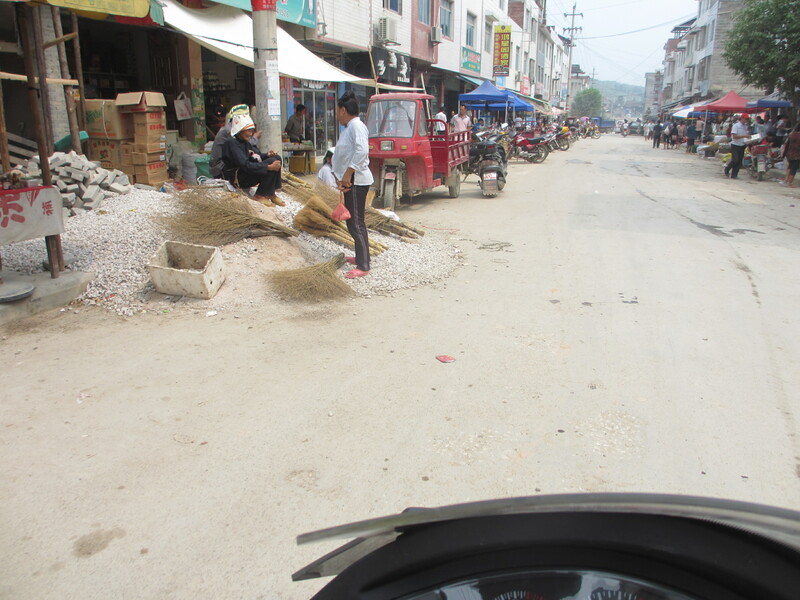 As we left Xingping towards Guizhou province on an unsurfaced road a peasant tractor towing a mini bus full of people that was on my right hand side suddenly veered left across my path and I narrowly missed it. 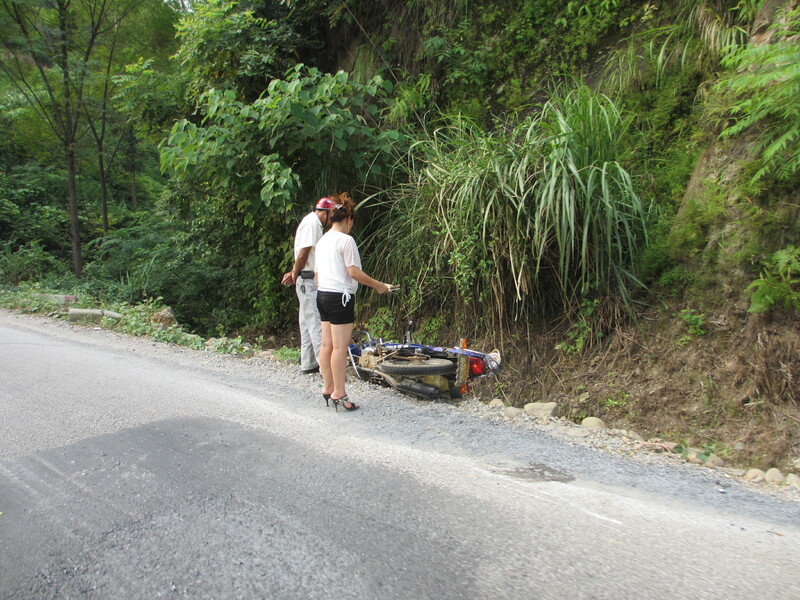 However, it forced Fanny who was immediately behind me off the road and into a sandy ditch and she dropped the bike causing a bruise to her arm and slight damage to her bike. I was furious and confronted the driver who was unrepentant and particularly surly. Other than smacking his blackened rotting teeth further into his ugly formed face there was little I could do. In fact, I could barely understand him, and was heartened that Fanny couldn’t understand him either, such was his dialect and distortion of “biaozhun” Mandarin. There was no question of compensation, no apology, in fact no recognition at all that he was driving badly and had caused an accident that injured a woman. I pondered the situation for a while and quickly realized it was like trying to communicate with an inanimate object. Pointless, and so we dusted ourselves down, and soldiered on. If you are a foreigner in China its best to avoid confrontation or losing your temper. No good will come of it. From Audi A6 cars to smoke belching trucks, the driving standard is universally selfish and inconsiderate throughout China. 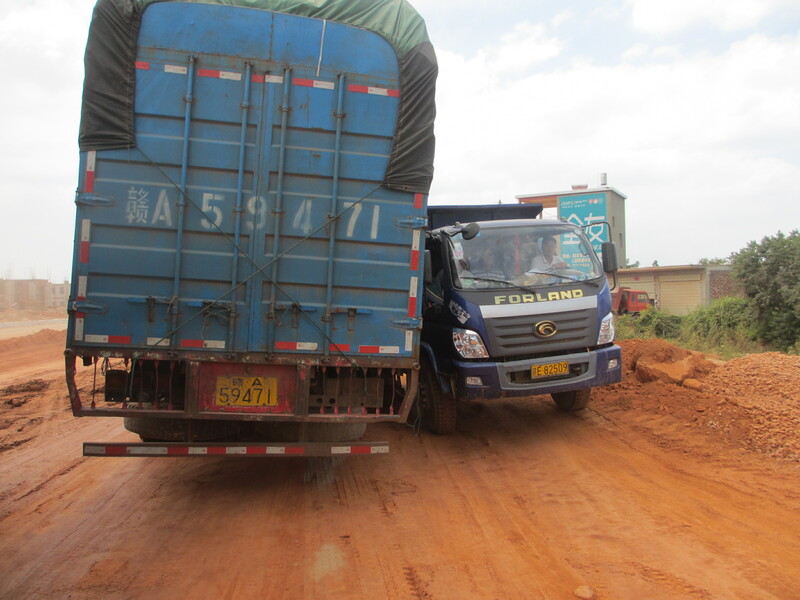 Note that in China one should drive on the right, not as this truck veering towards us is doing. Some of the roads are great, many are smashed to bits and potholed by overloaded trucks and through neglect and poor maintenance. Whilst the cities, traffic, pollution, architectural vandalism and never ending concrete and construction can get you down in China, the food is always fantastic and always cheered us up at the end of the day. 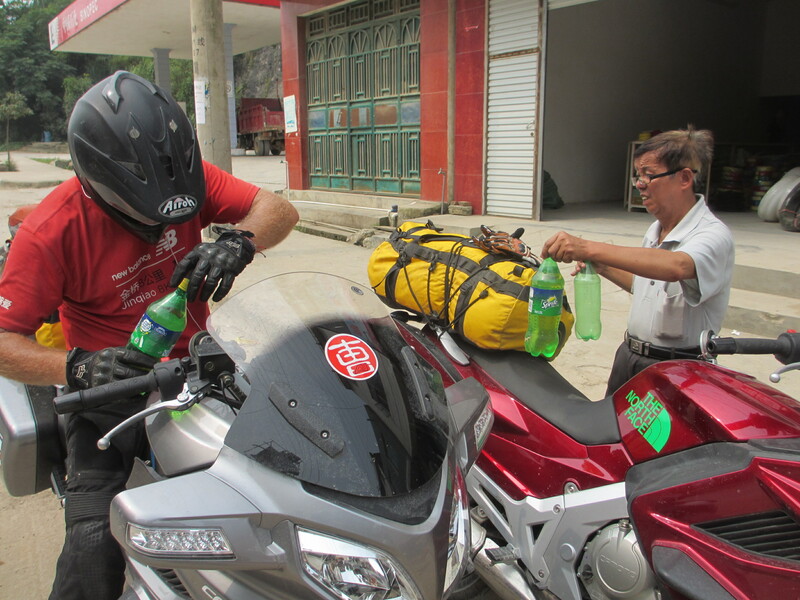 We were eating one main meal a day, with perhaps a few sunflower seeds (guazi), fruit from the side of the road, and Red Bull drinks and coffees from petrol stations the rest of the day. As is traditional in China we would prepare a flask of green tea and keep it filled up with hot water that is offered free along the way. Usually we would get up early, pack up our bikes, and get going, stopping only at petrol stations for fuel until we got to our final destination of the day. 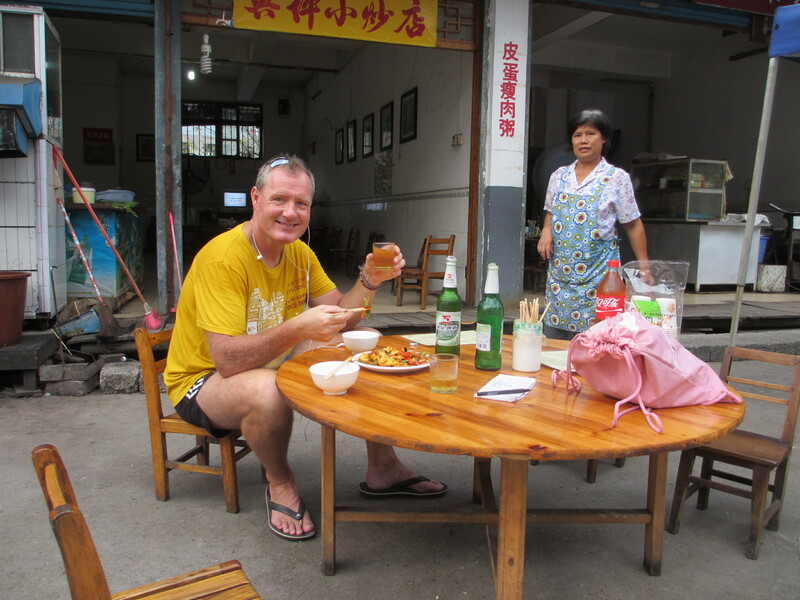 Sometimes we would camp, but more often than not we would stay in local hostels and “bingguan” that would cost no more than 100 RMB (US$15) for a room, take a welcome shower and then pay about 50-80 RMB (US$8-12) for a full blown Chinese dinner for two with local beer and green tea. I had put on weight in Europe, despite my efforts to train, run and hike as much as I could, but by the end of the second week in China I had lost 8 kilograms since I had arrived without really trying. I say without really trying… perhaps i should say without feeling hungry or making any effort. I am an authentic Chinese food addict and firmly believe the food, tea and indeed traditional medicine found across China and South East Asia is more nutritious and healthy than anything found anywhere else in the world. I guess I am better traveled than most and have spent a good deal of my adult life in China and so I feel this is a view I am qualified to hold. Anyway, you just have to compare the body shapes of local Chinese with huaren（overseas ethnic Chinese from the UK or the USA) to prove the healthiness and nutrition of respective diets. I’m just saying. A common site on the roads. 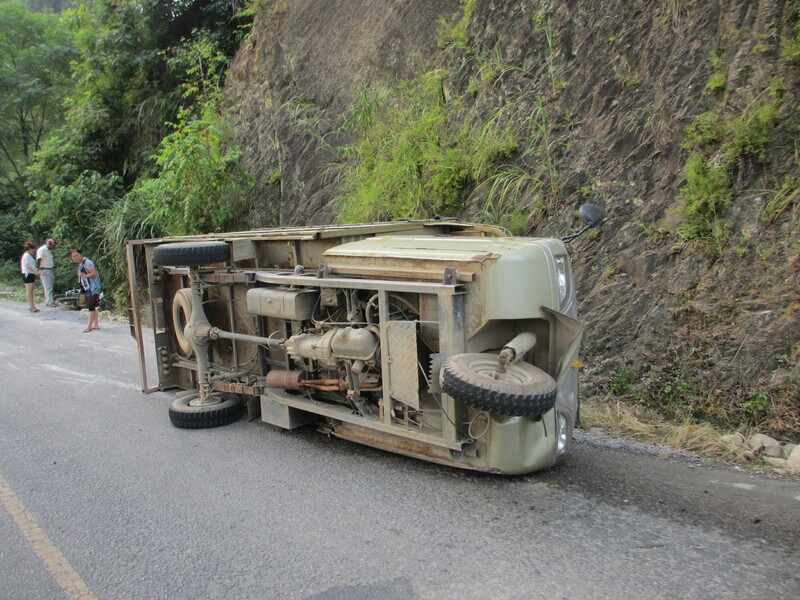 There are many smashes, cars and trucks on their sides or upside down in ditches. Hardly surprising to my mind as the driving standard is extremely poor and invariably selfish. Youzi 柚子 (Pomelo) are very good in Guangxi provence… we love them. 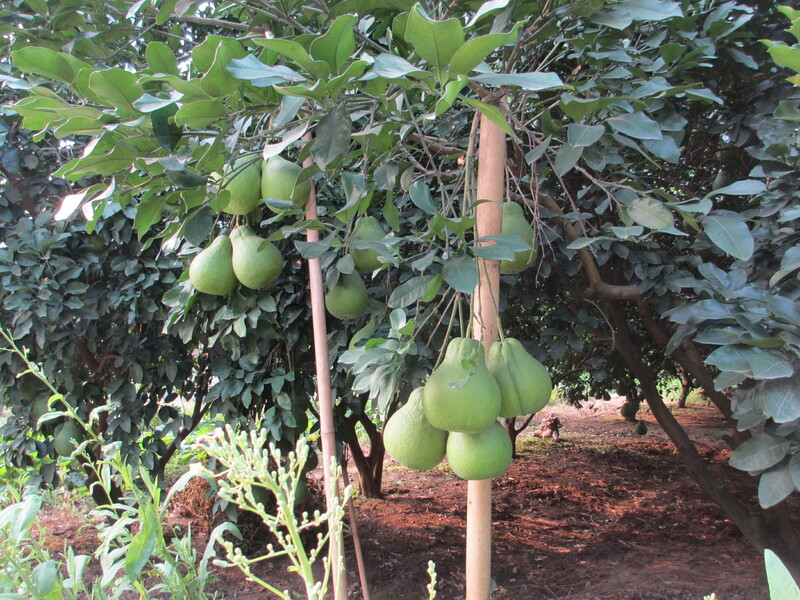 However the ones growing while we were there were not quite ripe or in season, sadly. 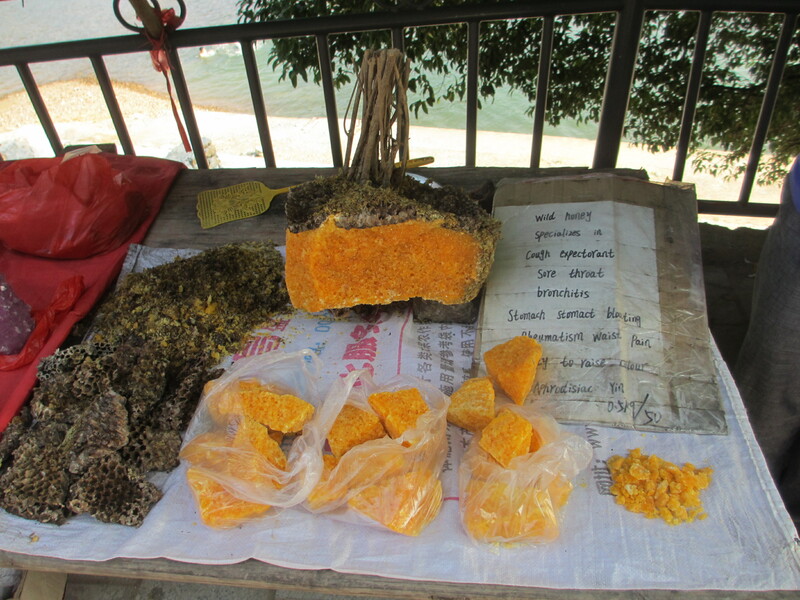 This is crystalline wild honey for sale at the road side in Xingping. I tried some and it is brittle with a very strong honey flavour. Supposedly good for all sorts of ailments as the English translation describes. 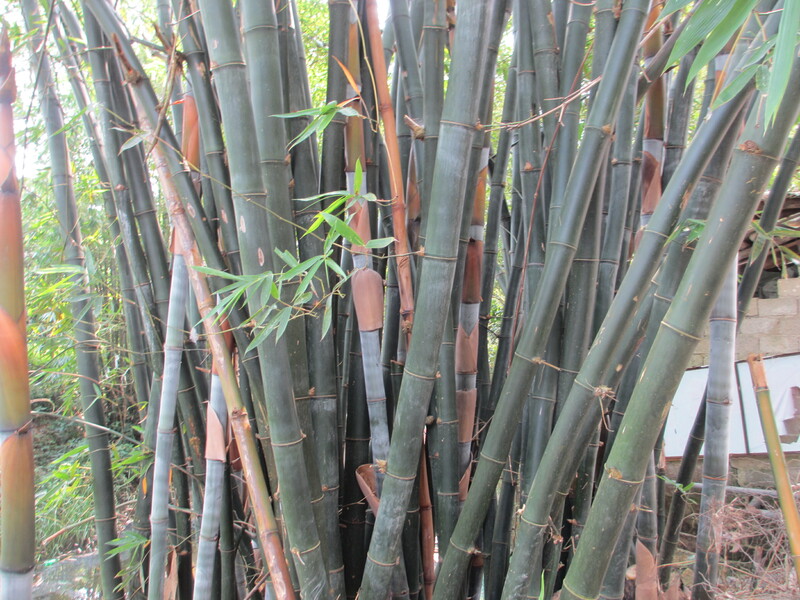 We passed through An Ji (Eastern China) where the movie ” Crouching weasel leaping bull frog” was filmed and its famous for endless valleys and forests of bamboo. 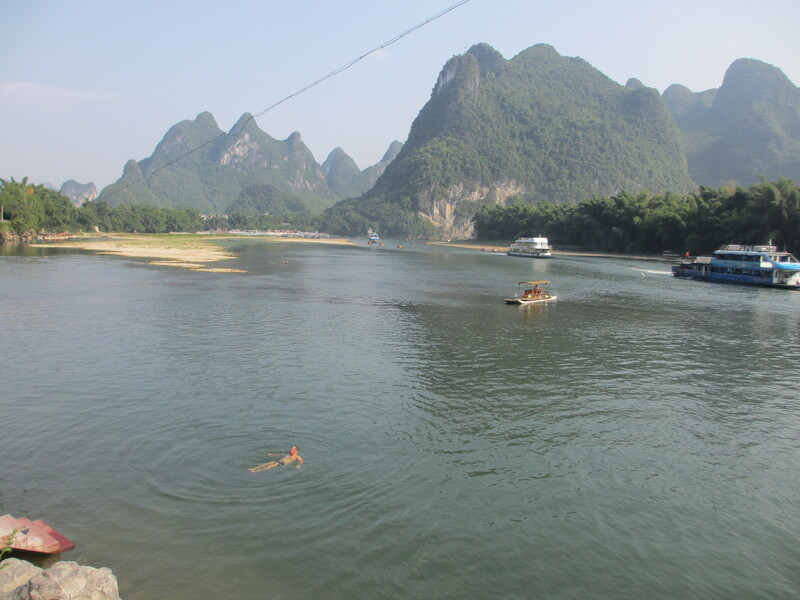 Having a swim in the Li Jiang river. Contrary to the rumours in the press I never saw or got bitten by a Shirenyu (Piranha). Allegedly many had been released into the local ecosystem by flushing them down the lavatory after they had eaten their fellow aquarium dwellers or the pet dog. The Chinese countryside and agricultural areas are usually very pretty and reasonably clean, provided the developers haven’t been meddling and trying to turn natural landscapes such as waterfalls into “No1 people’s glorious tourist site in the world”. 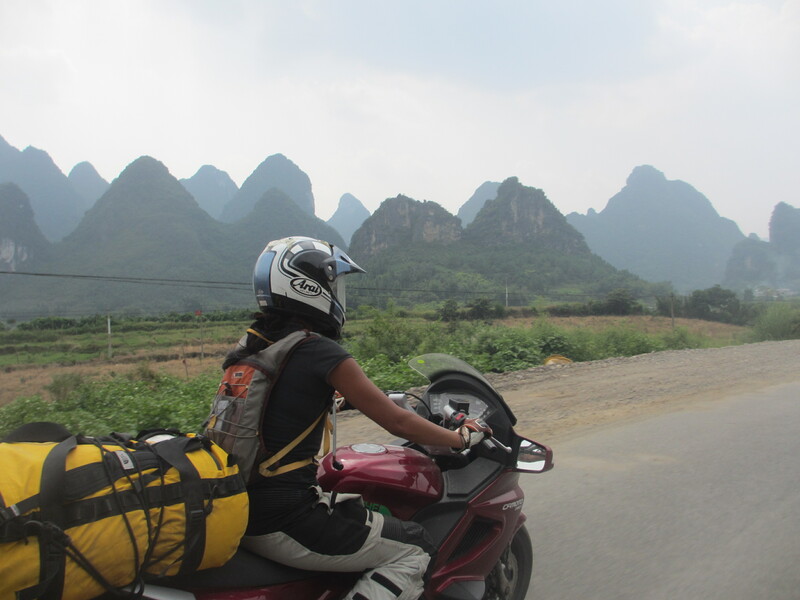 When we got to the remote parts of Guizhou .. a spectacularly remote part of the planet … there was no fuel in many of the gas stations and so we had to buy black market petrol. This entrepreneur who operated right next to the empty Sinopec gas station had filled up 7 UP bottles… which at double the pump price was still cheaper than any fuel found in Europe. 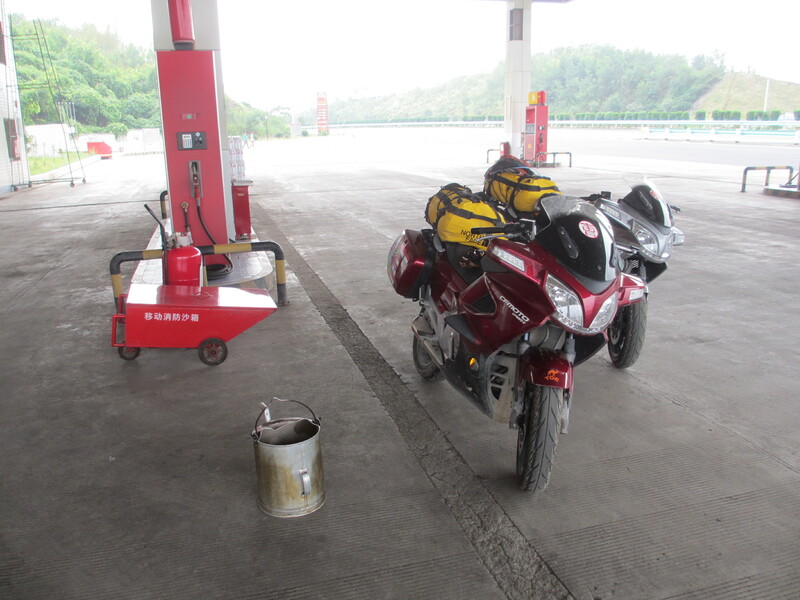 While we were in Guizhou, a particularly remote part of China, we found many of the petrol stations had run out of fuel and like in Africa the petrol pump attendants could give no idea when the petrol tanker would arrive to replenish their stock. Again, like in Africa, there were some entrepreneurial types who stock piled the fuel and sold it by the side of the road. Of course, where better to position your black market stockpile than right next to the garage that frequently runs dry and that is where Fanny found a chap selling petrol in clear 7 Up bottles at double the pump price. Nice business if you can get it. What was particularly amusing was that the marked up black market petrol was still cheaper than any petrol sold in Europe. 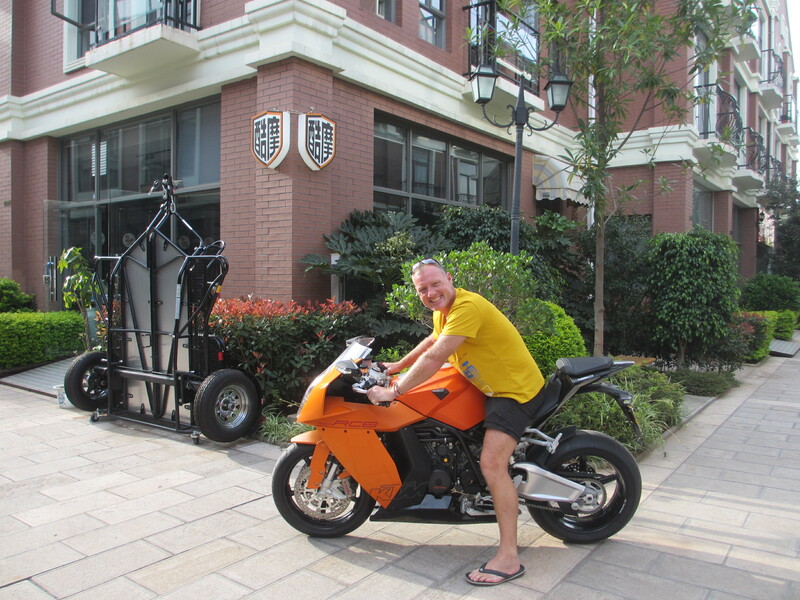 Whilst motorcycles are banned on Chinese expressways, and indeed in certain cities, like Hangzhou, we found we could easily get onto them by squeezing through the barriers which, unlike toll barriers in Europe, do not extend across the whole of the lane. There would inevitably be some frantic arm waving by the concerned looking toll booth staff, but the traffic police officers we passed just ignored us. In fact, in Guizhou motorcycles can use the newly constructed expressways even though we actually entered the expressway system illegally in Guangxi. In Guizhou, despite being one of the poorest provinces in China, the expressways are excellent, virtually empty and they crossed over dozens of impressive suspension bridges and through hundreds of tunnels across the mountainous province. This allowed us to make good progress towards Yunnan and at the same time get a birds eye view of the remote valleys, villages and mountains of Guizhou, a province with the most ethnic minority （少数民族）people and villages in the whole of China. A fascinating and remote place, and where, we were later to find, a botanist friend of ours from Poland found a new species of plant just the previous month. I made a mental note that one day Fanny and I should come back and do some serious hiking and exploring along the valleys and rivers of this unspoiled region. In Egypt its was God’s Will that one should crash, not poor driving ability or lack of attention. In China the drivers and riders think they are just “unlucky” when the inevitable traffic accident occurs. We saw many “unlucky” incidents. 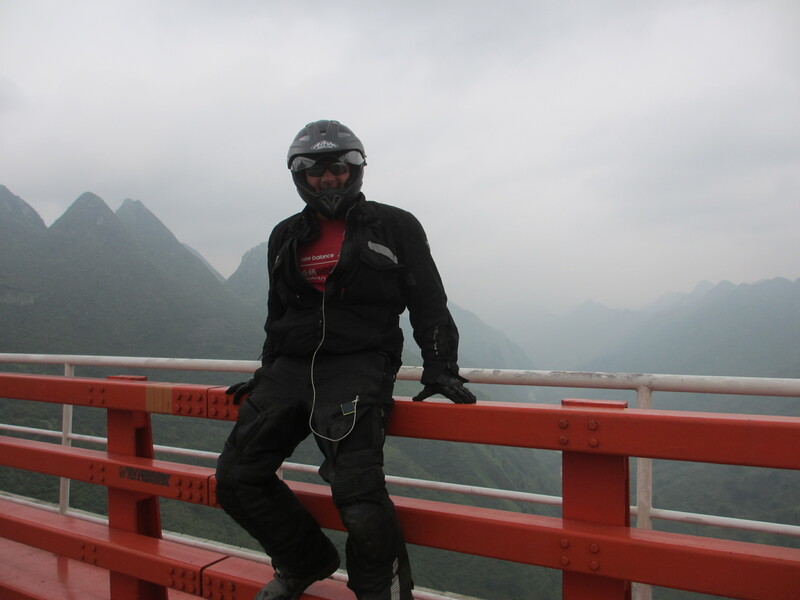 Whilst crossing one of the many bridges that span the gorges in remote Guizhou province we met the only other adventure biker so far riding a 350 cc Chinese bike called an “Eagle King”. 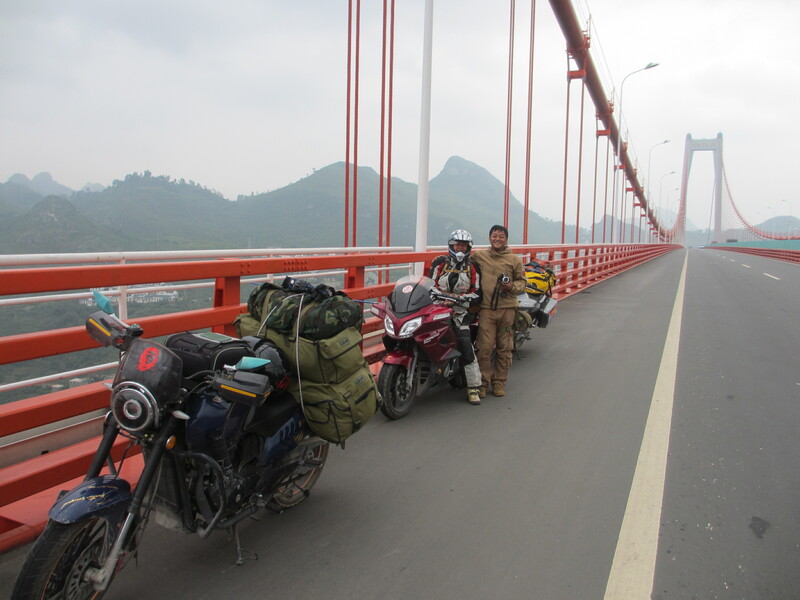 Mr Wang from Jilin had ridden from north east China and like us was also riding to Tibet. At many of the petrol stations we had to transfer the fuel from the pump into a tea pot or watering can thing and then pour into our tanks. We were told this was for safety reasons, but splashing fuel around unnecessarily didn’t seem very safe or logical to me. Trying to smile and yet not to lean back too much on one of many bridges we crossed that span deep valleys and canyons in Guizhou province. Whilst we were cruising along the three lane highway, which we had mostly to ourselves, we came across a fellow rider (Mr Wang from Jilin … a province of China that borders North Korea) on a fully laden up Chinese made adventure bike (“Eagle King”) who was riding from his home town in north east China to Tibet. He was the first real adventure biker we had met on the road so far and as with our fellow motorcyclists we had met in Africa and Europe we stopped by the side of the road to examine each others bikes, swap stories and share routes and plans. We continued many hundreds of kilometers along this elevated highway and got into Kunming in Yunnan province quite quickly. Despite not being allowed to ride motorcycles in the city we rode straight through it and passed many police officers who smiled and waved at us. 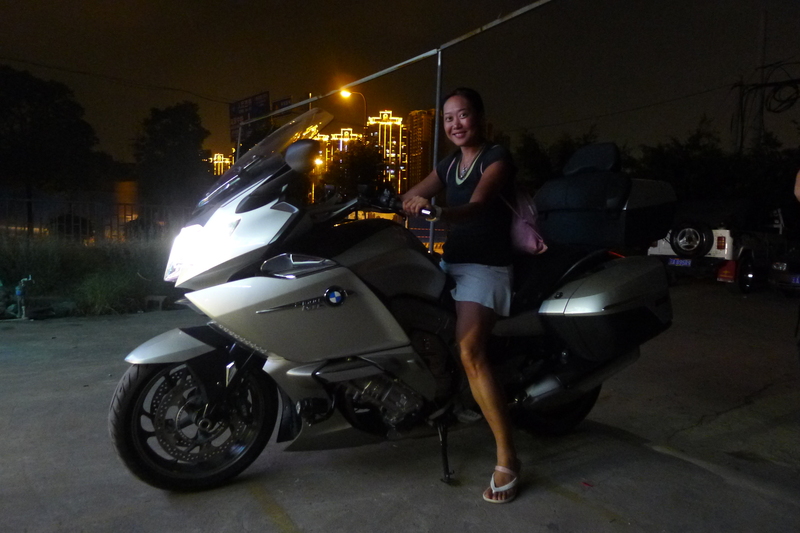 We rode to the “posh” end of town where Fanny had booked us into a superb hotel called Li Du Jiu Dian. Much to Fanny’s relief we could park the bikes right next to a 24 hour guard and under the gaze of the hotel’s 24/7 security CCTV cameras. Now she knows how I felt in Egypt when I left the KTMs outside our hotels in Alexandria and Cairo. 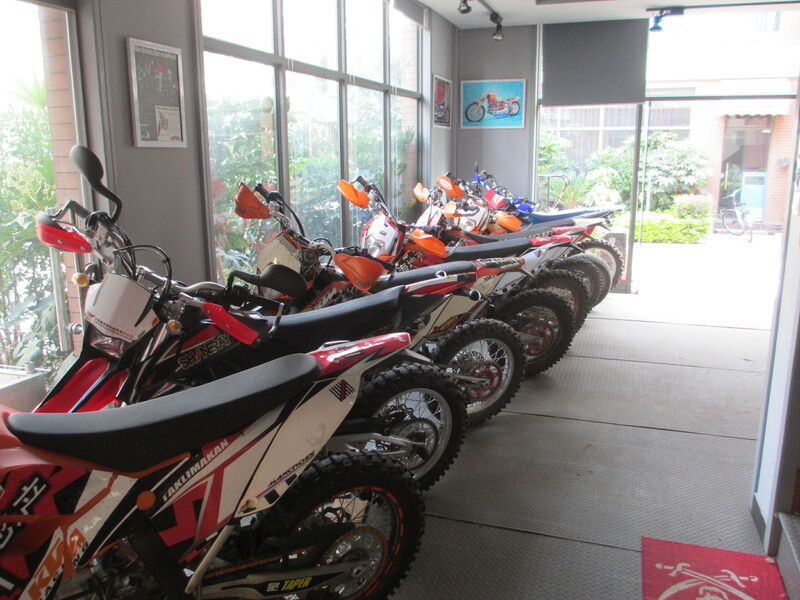 Whilst in Kunming we were looked after by Mr Qu, a former China motocross champion and veteran of the Xinjiang Rally. He also ran a rather elite motorcycle club called “Ku Mo” (酷摩）that was home to fifty or so BMWs, KTMs, Harley Davidsons and other exotic motorcycles. After some amazing Pu’er tea in the clubhouse I perked up considerably when I saw several KTM 450 motocross bikes, and was about to accept the offer to take one for a ride, when like a kid in a sweet shop, I saw an even nicer KTM RC8 racer and so I took this 1200cc super bike for a spin around the block dressed only (local Chinese style) in flip-flops and shorts. Had I come off the smile would probably have been permanently affixed to my ashen face, but as it was the smile lasted for several hours after I returned and as I blathered on incessantly to Fanny about how good the bike was, and about tyres, suspension, scribble and nonsense. In addition to Fanny writing articles for various travel magazines, keeping her popular Weibo blog up to date, organizing the whole of the China leg of the expedition, and applying for various jobs for when the expedition is over, she also had the difficult task of getting me, (“old foreigner”), into Tibet. At that time no foreigners at all were being allowed into Xizang (Tibet). Even Tibetan Travel Permits were suspended because the 18th Chinese National Congress was being held at the time and there continued to be some ethnic disturbances in the autonomous provinces of Xizang and Xinjiang. China is very sensitive about foreign interference with what it calls its “internal affairs” and the government did not want any foreigners “causing trouble”. 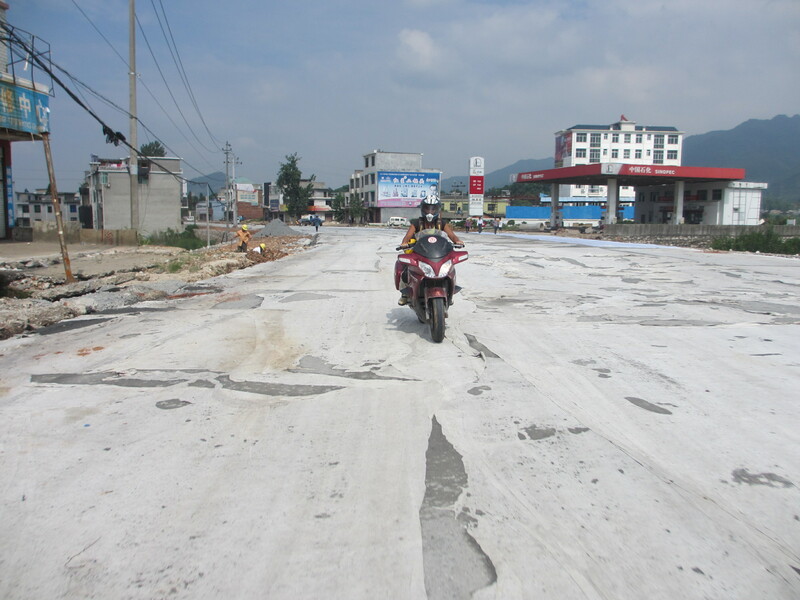 This was a major blow to our plans and I really wanted to ride through Tibet. However, we had a cunning plan and all will be revealed in the next chapter of this diary. Will I see zhumulandmafeng (珠穆朗玛峰 – Mount Everest) or will we have to detour north into Sichuan province and skirt around Tibet? 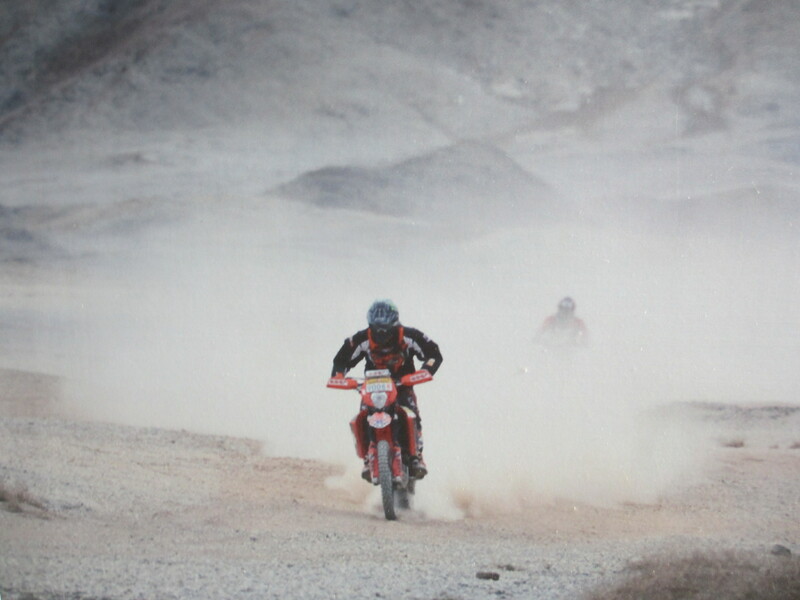 Our host, Mr Qu from Kunming competing in the Xinjiang Rally … he came third. 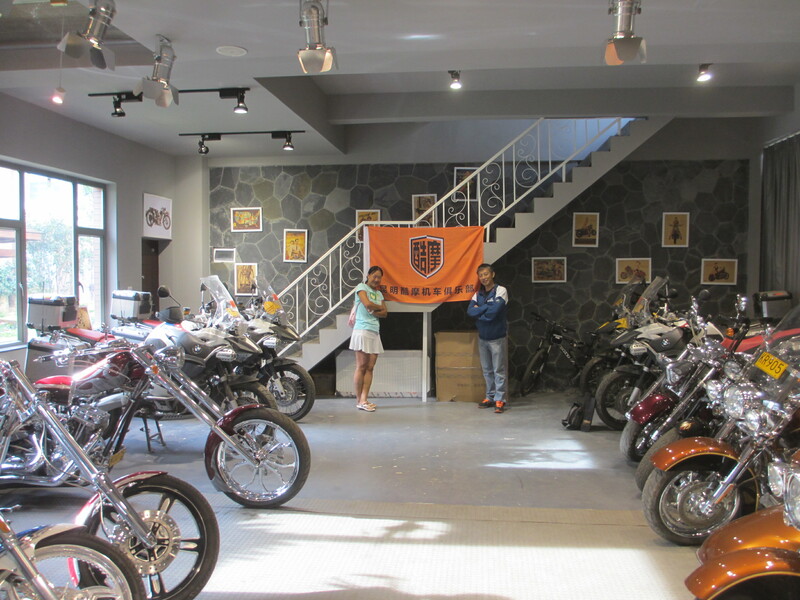 Fanny and Mr Qu at his club house in Kunming with some of their huge collection of KTM, BMW, Harley Davidson, Aprilia, Honda and Royal Enfield bikes. This is not a cheap hobby in China where bike prices are three times more than the US or UK. Our kind host, Mr Qu taking us to a local Yunnan restaurant in Kunming where we had a delicious local vegetarian feast. Thank you. This entry was posted in Bikes, China, Fanny, KTM, Mechanics, People, Places, Preparations, Route, Rupert, Uncategorized. Tagged CF Moto, China, Fanny, Guilin, Guizhou, KTM, motorcycle, Rupert. 1) Could the peasant still not care less after Fanny “explained” things? 2) I see you are a western bum Rupert. 3) I remember years back, not in such a remote area, being started at by the elderly people in their Mao suits and having the children run up to touch me, or push each other to make them touch me. It was like being a pop star – but without the money. Whoa, one minute you are in rainy nasty old in England and then suddenly you’re there. Brilliant. Glad you made it. This post (and the one below) just made me smile, and brought back many memories…of bad driving and people eating lots of strange objects. It is so beautiful there. Good luck with this leg of the journey. Sorry but I love these new bikes. Can’t wait to hear more. Reblogged this on Rupert & Fanny's Big Bike Trip.